Siegfried is the name of the mythic national hero of the Germans, whose tragic fate is most powerfully described in the "Nibelungen Lied," and in a series of lays of the Icelandic Edda. A matchless warrior, a Dragon-killer and overthrower of Giants, who possesses a magic sword, he conquers the northern Nibelungs and acquires their famed gold hoard. In the great German epic he is the son of Siegmund and Siegelinde, who rule in the Netherlands. Going Rhine-upward to Worms, to Gunther, the King of the Burgundians, he woos and wins Kriemhild, the beautiful sister of that king, after having first helped Gunther to gain the hand of Bruenhild, a queen beyond sea, in Iceland. No one could obtain that valiant virgin's consent to wedlock unless he proved a victor over her in athletic feats, and in trials of battle. By means of his own colossal strength and his hiding hood, Siegfried, standing invisibly at the side of Gunther, overcomes Bruenhild. Even after the marriage has been celebrated at Worms, Siegfried has once more to help the Burgundian king in the same hidden way, in order to vanquish Bruenhild's resistance to the accomplishment of the marriage. When, in later times, Kriemhild and Bruenhild fall out in a quarrel about their husbands' respective worth, the secret of such stealthy aid having been given, is let out by the former in a manner affecting the honor of the Burgundian queen as a wife. Thereupon Hagen promises her to effect a revenge. Having deftly ascertained from Kriemhild the single vulnerable part of the hero, whose skin had otherwise been made impenetrable by being dipped into the Dragon's blood, Hagen treacherously murders Siegfried at a chase. The gold hoard is then sunk in the Rhine by Hagen, lest Kriemhild should use it as a means of bribing men for wreaking her own revenge. She afterward becomes the consort of Etzel, the heathen king of the Hiunes (Hunns) in Hungary, who resides at Vienna. Thither she allures the Burgundians, Hagen alone mistrusting the invitation. In Etzel's eastern land all the Burgundian knights, upon whom the Nibelung name had been conferred, suffer a terrible death through Kriemhild's wrath. Hagen, who refuses to the end to reveal to her the whereabouts of the sunken gold hoard, has his head cut off with Siegfried's sword by the infuriated queen herself. At last, she, too, is hewn down by the indignant, doughty warrior, Hildebrand; and so the lofty Hall, into which fire had been thrown, is all strewn over with the dead. "Here," says the poem, "has the tale an end. These were the sorrows of the Nibelungs." In this "Iliad of the Germans," which dates from the end of the twelfth century, the Siegfried story is given as a finished epic. But its originally heathen Teutonic character is overlaid there with admixtures of Christian chivalry. In the Edda and other Scandinavian sources, the tale appears in fragmentary and lyrical shape, but in a purer version, without additions from the new faith or from mediaeval chivalry. It is in the Sigurd-, Fafnir-, Brynhild-, Gudrun-, Oddrun-, Atli-, and Hamdir Lays of the Norse Scripture that the original nature of the older German songs, which must have preceded the epic, can best be guessed. Rhapsodic lays, referring to Siegfried, were, in all probability, part of the collection which Karl the Great, the Frankish Kaiser, ordered to be made. Monkish fanaticism afterward destroyed the valuable relics. Fortunately, Northmen travelling in Germany had gathered some of those tale-treasures, which then were treated by Scandinavian and Icelandic bards in the form of heroic lyrics. Hence the Eddic lays in question form now a link between our lost Siegfried "Lieder" and our national epic. Even as in the "Nibelungen Lied" so also in the "Edda," Sigurd (abbreviation for Siegfried) is not a Scandinavian, but a Southern, a Rhenish, a German hero. The whole scene of the tragic events is laid in the Rhinelands, where the killing of the Worm also takes place. On a hill in Frank-land Sigurd frees Brynhild from the magic slumber into which Odin had thrown her on a rock of punishment, because she, as a Valkyr, or shield-maiden of his, had brought about the death of a Gothic king to whom the god of battle had promised victory. In the south, on the Rhine, Sigurd is murdered. In the Rhine, Hoegni (Hagen) hides the Nibelung treasure. Many German tribes--Franks, Saxons, Burgundians, Goths, even a Svava-land, or Suabian land, are mentioned in the "Edda." The "Drama of Revenge," after Sigurd's death, though motives of the act somewhat different from those stated in the "Nibelungen Lied" are assigned, is also localized on the Lower Rhine, in the Hall of Atli, the King of the Hunes. In the "Nibelungen Lied," that name appears as Etzel (Attila), King of the Hunns. In the "Edda" and in the "Vilkina Saga," Germans are referred to as sources for some details of the Sigurd story. So strong was, in Scandinavia, the tradition of the Teutonic origin of the tale, down to the twelfth century, that, in a geographical work written in Norse by the Abbot Nicolaus, the Gnita Heath, where Sigurd was said to have killed the Dragon, was still placed half-way between Paderborn and Mainz. Thus it was from Germany that this grand saga spread all over the North, including the Faroeer. In the "Hvenic Chronicle," in Danish songs, we even find Siegfried as "Sigfred;" Kriemhild as "Gremild;" and she is married to him at Worms, as in the "Nibelungen Lied," while in the "Edda" Sigurd's wife is called Gudrun, and the remembrance of Worms is lost. The scene of the Norse poems is wholly on Rhenish ground. Now, in that neighborhood, in the northwest of Germany, a Teutonic tribe once dwelt, called Hunes, which is also traceable in Scandinavia. Sigurd himself is, in the "Edda," described as a Hunic king. His kith and kin dwell in Huna-land. "Hune" probably meant a bold and powerful warrior. The word still lingers in Germany in various ways; gigantic grave-monuments of prehistoric times are called Hunic Graves or "Huenen-Betten," and a tall, strong man a "Huene." In his "Church History" the Anglo-Saxon monk Baeda, or Bede, when speaking of the various German tribes which had made Britain into an Angle-land, or England, mentions the Hunes. In the Anglo-Saxon "Wanderer's Tale" they also turn up, apparently in connection with a chieftain Aetla; that is, Atli. In Friesland, the Hunsing tribe long preserved the Hunic name. The word occurs in many personal and place names both in Germany and in England; for instance: Hunolt (a Rhenish hero), Hunferd, Hunlaf, Hunbrecht (champions among Frisians and Rhinelanders in the "Beowulf" epic); Huneboldt (bold like a Hune); Ethelhun (noble Hune); then there are, in German geography, the Hunsrueck Mountain; Hunoldstein, Hunenborn, Hunnesrueck, near Hildesheim, etc. Again, in England: Hundon, Hunworth, Hunstanton, Huncote, Hunslet, Hunswick, and many other places from Kent and Suffolk up to Lancashire and Shetland, where certainly no Mongolic Hunns ever penetrated. The Hunic Atli name is also to be found on English soil, in Attlebridge and Attleborough. After the Great Migrations the various tribes and races became much intermixed. It was by a misunderstanding which arose then between the German Hunes and the Hunns under Attila's leadership, that Kriemhild's revenge after the murder of Siegfried was poetically transferred from the Rhine to the Danube. The name of the Rhenish Atli, which is preserved in the "Edda," and which also occurs as a German chieftain's name on the soil of conquered Britain, easily served to facilitate the confusion. Even the composition of Attila's army lent itself to this transplantation of the second part of the Siegfried story to Danubian lands. For, though Attila was overthrown on the Catalaunian fields, mainly by Germanic hosts, to which Roman and Gallic troops were added, he had a great many Teutonic warriors in his own army. From this military intermingling of races so utterly dissimilar in blood and speech as the Hunns and the Germans, one of whose tribes were called Hunes, it is not difficult to conceive the shifting of the tragic issue of the Nibelung story to the East. Attila, the Hunn, slid into the previous Teutonic hero-figure of Atli, the Hune. This change will the more easily be understood when the deep impression is remembered which the terrible Mongolic war-leader had made on the popular mind in southern Germany, where the Nibelungen epic was cast into its present shape. The hold which the Siegfried story has had on the German people, through ages, can be gathered from the fact of its having kept its place, down to our days, in the workman's house and the peasant's hut, first by oral tradition, and then by rudely printed and illustrated chap-books ("Die Geschichte vom huernenen Siegfried"). In this "Volksbuch" there are remarkable details concerning the hero's early life in a smithy and the prophecy of his assassination, which are lost in the "Nibelungen Lied," but preserved in the "Edda." This circumstance--overlooked even by Simrock, who, like Jacob Grimm, has done much to show the German origin of the Norse Sigurd saga--is another curious bit of evidence of the undeniable Teutonic source of the corresponding Scandinavian and Icelandic stories and poems. Many attempts have been made to get at the historical kernel of the tale. Some would see in it traces of the songs which, according to Tacitus, were sung, of old, in honor of Armin (usually, though mistakenly, called Hermann), the deliverer of Germany from the Roman yoke. It has been assumed that the contents of these songs were combined with traditions of the deeds of Civilis, the leader of the Batavian Germans against Roman dominion, as well as of the conquest of Britain by Hengest. Recently, the Norse scholar, Gudbrand Vigfusson, has once more started this "Armin" interpretation of the tale, under the impression that he was the first to do so; whereas, in Germany, Mone and Giesebrecht had worked out that idea already some sixty years ago. In order to support his theory, Vigfusson boldly proposed to change the Hunic name of Sigurd, in the Eddic text, into "Cheruskian." He imagined the former name to be absurd, because Siegfried was not a Hunn; but Vigfusson was unacquainted with the wide historical distribution of the Hunic name in Germany and England. Others saw in the Siegfried story an echo of the overthrow of the Burgundian king Gundahari (Gunther), by Attila, on the Rhine. Gundahari, who first threw himself with an army of 20,000 men against the Hunnic leader, gloriously fell with all his men. In the same way, in the "Nibelungen Lied," the Burgundian king, Gunther, is killed, with all his men, in the land of Etzel, the ruler of the Hiunes. Again, others have pointed to the feats of Theodorick, the king of the Eastern Goths; or to the fate of Siegbert, the king of the Austrasian Franks, who was murdered at the instigation of Fredegunda; or to the powerful Frankish family of the Pipins, from whom Karl the Great hailed, by way of trying to explain some parts of the Siegfried story. With the Pipins of "Nivella," we come upon a word in consonance with "Nibelung." Then the wars which the Frankish Kaiser Karl waged against the Saxons of Witukind, have been held to be indicated in the war which the Frankish Siegfried, in the "Nibelungen Lied," wages against the Saxons. To all appearance, however, the tale is a mixture of mythological and historical traditions. In the Middle Ages, and still much later, Siegfried was looked upon as an undoubtedly historical figure. His praise was sung through all Germany. His very tomb, one of his weapons, as well as his carved image, were shown under the name of Siegfried's grave, Siegfried's spear, and Siegfried's statue. So persistent was this belief that when, in the fifteenth century, Kaiser Frederick III. came to Worms, he had the alleged grave of "that second Hector and powerful giant" opened, to see whether his bones could be found. Only a head and a few bones were dug up, "larger than men's heads and bones usually are." At Worms, the Siegfried story was pictured, in ancient times, in the Town Hall and on the Mint. All round Worms, place-names connected with the Nibelung tale occur with remarkable frequency. If the lost rhapsodic songs could be recovered, both mythological and historical allusions would, in all likelihood, be found in them. An eminently Frankish tale, the Nibelungen cycle, has arisen in that martial German tribe which once held sway in the greater part of Europe. In its origin, the tale is considered by many careful investigators--so also by Richard Wagner, who founded his famous music-drama on it--to have been a Nature myth, upon which real events became engrafted. From this point of view, the earliest meaning of Siegfried's victory over the Dragon would signify the triumph of the God of Light over the monster of the chaotic aboriginal Night. It would be, on German ground, the overthrow of Python by Apollon. In this connection it is to be pointed out that Sigurd appears in the "Edda" as the hero "with the shining eyes," and that, in one of the German Rose Garden tales, twelve swords are attributed to him--a description which might be referred to the zodiac and to sunshine; so that he would be a solar hero. And even as Day is, in its turn, vanquished by Night; as Summer must yield to Winter; so also Siegfried falls in the end. The god which he originally was thus becomes human; the sad fate of so noble a champion gives rise to feelings of revenge for what is held to be an evil and criminal deed; and a tragedy is constructed, in which generations appear as actors and victims. A special feature of the Frankish myth is the hoard, the fatal treasure which works never-ending mischief. It is said to represent the metal veins of the subterranean Region of Gloom. There, as is stated in an Eddic record, Dark Elves (Nibelungs, or nebulous Sons of the Night) are digging and working, melting and forging the ore in their smithies, producing charmful rings that remind us of the diadems which bind the brows of rulers; golden ornaments and sharp weapons; all of which confer great power upon their owner. When Siegfried slays the Dragon, when Light overcomes Darkness, this hoard is his booty, and he becomes master of the Nibelungs. But the Dragon's dark heir ever seeks to regain it from the victor; so Night malignantly murders the Day; Hagen kills Siegfried. The treasure on which Siegfried's power is founded becomes the cause of his death; and through Death he himself, albeit originally a refulgent God of Light, is turned into a figure of gloom; that is, a Nibelung. There is much in the Norse Skalds which seems to support this mythological aspect of the tale. The name of Siegfried's murderer, Hagen--who is one-eyed, even as Hoedur, the God of Night, who kills Baldur, the God of Light, is blind--has also been adduced for this interpretation. Hagen is explained as the Thorn of Death, the hawthorn (German Hagedorn), with which men are stung into eternal sleep, or rather into a death-like trance. 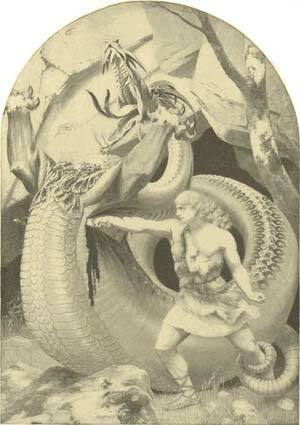 Odin stings Brynhild into her trance with a sleeping-thorn. Hagen, in the sense of death, still lingers in the German expression, "Friend Hain," as a euphemism for the figure which announces that one's hour has come. The hawthorn was the special wood used for fire-burial in Germany; hence the figurative poetical expression which would make Hagen a synonym for death. In the German and Norse poems, as we possess them now, myth and apparently historical facts are inextricably welded together. A powerful representation of the Siegfried tale is given in the series of large pictures, at Munich, by the distinguished painter Schnorr von Karolsfeld.